With great pleasure we announce our upcoming Rotary Fundraiser. 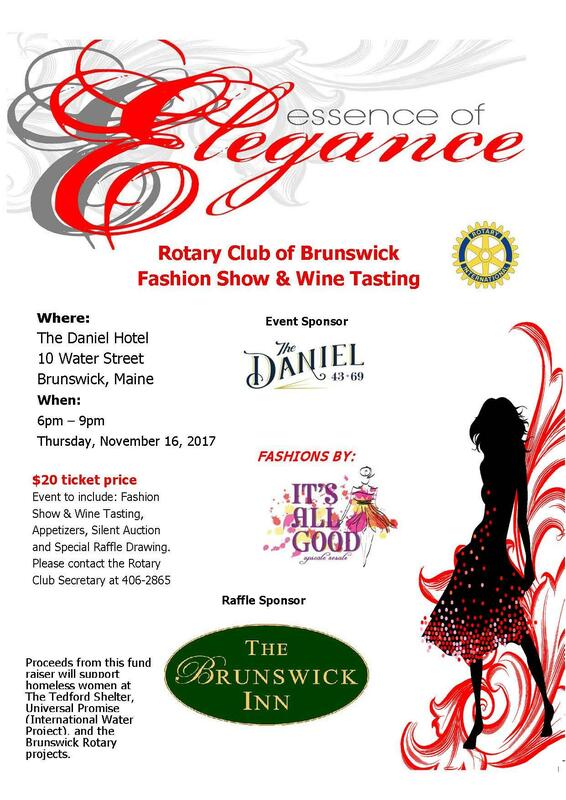 On Thursday, November 16th, we will be presenting our first Essence of Elegance Fashion Show from 6 to 9 pm at The Daniel. This event will include a wine tasting sponsored by Bailey Island Lobster, with hors d'oeuvres, sponsored in part by The Daniel, from 6 to 7 pm. From 7 to 8 pm we have 8 models in full attire, each modeling 2 outfits from It's All Good. Evening wear, business attire, casual wear, and business casual, from shoes and scarves to handbags and dresses and everything in between it will appear on the runway from 7 to 8:15pm. Outfits worn that evening may be purchased at the time of the event if so desired. Jewelry sponsored by Indrani's will adorn each outfit. The models hair will be primped and styled by the hairdressers at Starz Beauty Salon. From 8:15 to 9 The Daniel will be serving coffee and tea, with desserts from Wild Oats Bakery. A small silent auction will run from start to finish, along with an overnight stay at The Brunswick Inn and dinner for two being raffled off. Table arrangements are being provided by Flowers Etc. and The Daniel is giving us their facility for the evening event. Tickets are $20.00 per person and are available at It's All Good, Indrani's, Brunswick Rotary Meetings, or by calling our secretary Steve Baldwin at 406-2865. This event benefits our Rotary Club, homeless women that Tedford Housing serves and Universal Promise, an international water project. Please plan on attending this fun event, and make sure to bring a friend.